So this topic came up the other day with a client of mine so I wanted to touch upon this a little more for everyone. My client to be unnamed has been battling lower back pain and was trying to put together a solid leg workout without barbell squats. Telling a guy like me with a background in raw power lifting to prepare a leg routine without squats is like saying you want a peanut butter and jelly sandwich without the jelly. You are missing the single greatest link to the chain of success here. But, in my wisdom I do realize not just squatting will build the legs up, but in the process there are exercises to stay away from, especially to avoid knee pain. The single greatest movement for causing knee problems is….wait for it…..the leg extension! Why Not Leg Extensions and What Can I Do Instead? The major issue with the leg extension is that when you lift the weight up to contract the quadriceps’ muscles, all the tension is focused on the patella. Years ago people used to think that squatting was bad because it puts too much stress on the knees, when the truth is that the leg extension, even when using sub maximal weights, will apply more pressure to your knees than a heavy squat workout. So what can you do instead of squats if you are having low back pain? The best exercise to use as your new primary movement in your leg routine is a dumbbell split squat with your back leg raised…See below. I would highly recommend giving this one a try. It will keep all the pressure off of your lower back, and still hit the legs in their entirety just like a squat. As far as number of reps or sets, this will vary depending on your fitness goal. Personally, since I am still able to squat not having any back issues I use this as a secondary move to squatting, performing 3-5 sets at 8-12 repetitions per leg. But for someone using it as a primary movement I would be sure to get a good 5 sets minimum in on this to make sure you are getting enough work in on those legs! So what’s your favorite leg exercise? Leave a comment below on your favorite go to moves for leg workouts. Decide today to motivate yourself to change your mind and get the results you want! This time of year brings about many ambitious individuals that have great intentions of starting there new year right. But did you know that by January 15th literally 95% of all resolutions made will be broken! Yes, 95% is what statistics show. This number is truly staggering so today I want to discuss how to not become one of these 95% and how to have a productive 2017. With any resolution you may have the best place to start is by picking a goal that is realistic. For example, if your $200,000 dollars in debt and you make a resolution to be worth a million dollars within a year, this is most likely not the most feasible. But, if your goal is to reduce your debt by 50% or reduce debt completely that may be doable depending on your situation. Fitness and weight loss resolutions every year are one of the most popular. People always strive to look and feel better, but it seems that they are also the quickest resolutions to crumble. When the alarm clock goes off an hour too early, or when you leave work and planned on going to the gym but went straight home instead. These practices are all too common this time of year. Over 80% of actual gym memberships purchased are never even used one time! So what do we do initially to make sure we do not become just another statistic? So when a fitness coach starts a blog post with how to cheat on your diet properly you may be wondering if they have lost their marbles….No I haven’t. Here is what I mean. Often times I see clients that will start on their diet strong initially and then completely fall of the wagon to where no amount of exercise is going to make up for the daily damage being leashed on their bodies. I completely understand that when dieting you will have your ups and downs, moments where you want to just throw in the towel. But instead of just giving in completely try to use some balance to help keep you on the right path. This is where the old 80/20 approach can be helpful. The 80/20 rule refers to sticking to your meal plan at a minimum 80% of the time, while the other 20% is left for “cheating” or cheat meals. Now, to be clear on this, a cheat meal is NOT a pint of Ben and Jerry’s ice cream. A cheat meal may be that favorite pasta dish you haven’t had for a month because it hasn’t fit in your plan, or a couple slices of pizza. Sensible, enjoyable, but nothing too extreme. As a coach I always urge my clients to stick to their plans as close as possible so we can track their results with the most accuracy possible. But, I also understand that not every client is going to do this, so this is where the 80/20 approach can be helpful. Just always remember, a cheat meal is just that….One Meal! Secondly, it’s not just a plateful of candy but a favorite meal you haven’t had in a while. For all you current new years goal seekers, what is your favorite cheat meal? Leave your favorite in the comments below. NUTRITION FX IS NOW OFFERING FREE CUSTOM MEAL PLANS WITH ANY PURCHASE! Get on the right track today to reach your goals faster by getting your own fully customized meal plan geared toward your fitness goals! Use promo code fit20 to get an additional 20% OFF any purchase now! Don’t wait and get started today! New easy recipe that is delicious. 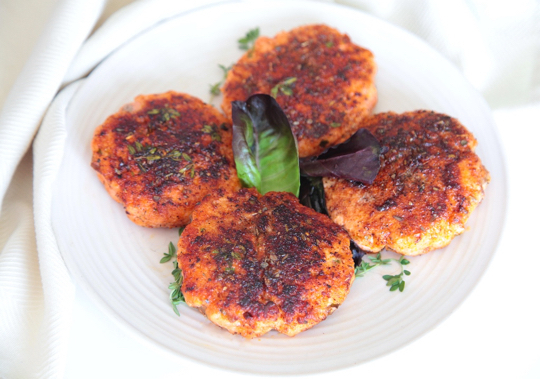 Salmon burgers can me made in a bunch of different ways, and as always they are packed with omega 3’s and high in protein. Check it out. Place 1/4 of the salmon pieces in the food processor and blend into a smooth paste. Add the rest of the salmon, the green onions and salt. Pulse several times until the salmon pieces are about 1/4-inch/6 mm in size. Be careful not to over-process the mixture, the texture should remain a little chunky. If the texture becomes too smooth, the salmon won’t hold together into burger patties. In a small bowl, mix together the smoked paprika, garlic powder, onion powder, black pepper, cayenne, thyme and oregano. Sprinkle the spice mix over each side of each burger, patting gently with your fingers so the spices stick to the salmon. Heat a few tablespoons of oil in a non-stick skillet over medium-high heat. Cook 2 minutes per side, then lower the heat and add a lid for 1 minute more until there is no raw, dark pink salmon in the middle. The burgers can also be grilled, just make sure the grates are clean and well oiled so the burgers don’t stick. Serve Cajun salmon burgers with a dollop of mayonnaise. You can use a side of original PRIMAL KITCHEN™ Mayo, or mix it with lime juice and/or smoked paprika. It’s time to get your game face on and make it happen!